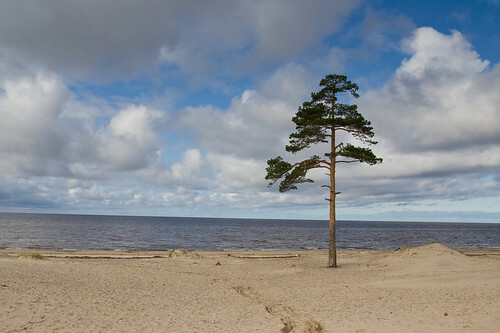 Lonely pine, a photo by Mothlike on Flickr. 1) People generally travel with other people, such as their friends and family, rather than alone. There is a lot of data to support this. 2) Japanese tourists are more likely travel in group tours more than those from Western countries. In a survey of about 550 Chinese, Japanese, Korean, and North American tourists visiting Thailand and Australia by Linda Osti, in 2007. It was found that Japanese were second most likely to travel in package tours, after the Chinese, and approximately twice as likely to travel as part of a package tour when compared to US citizens (see green bars in the graph from Osti, 2007, p128, below). Of visitors to Hungary in 1994, 25.3% of Japanese and only 6.1% of all other tourist were part of a package tour (Balaz & Mitsutake, 1998, p439). Of travellers to Melbourn Australian in 1996, Japanese were far more likely than Australian and, about twice as likely as US, Canadian and Chinese tourists to be travelling on a package tour (see graph compiled from the data in table 1, Turner, Reisinger, & McQuilken, 2002, below). 3) On the other hand, however, in answer to the survey question do you "Prefer to travel with friends rather than alone" only 59% of Japanese men replied in the affirmative. In the same survey as quoted first above, "the Japanese are the least likely to travel with a partner of with the family: only 3% travelled with the family and 16% with a partner, while 33% travelled alone and 41% with friends. North American travellers are most likely to travel with a partner (32%)" (Osti, 2007, p129) .In other words, perhaps, Japanese travel in groups but on their own. There are economic/convenience advantages to travelling in groups. There may be aesthetic, emotional and cultural advantages to travelling alone. Suma is a famous place in what is now Hyogo prefecture, where one of the last of the Heike clan was defeated, and the pine is referred to in a poem written in the tenth century, to commemorate which Basho is visiting this lonely spot. Indeed, the whole travelogue expresses the famous sabi aesthetic (of wabi sabi fame), the central characteristics of which is the appreciation of loneliness. Wabi and sabi are notoriously difficult to translate. Many Japanese are of the opinion that non-Japanese can not appreciate the emotions that these words express. They are related to Buddhism. It seems to me that they are not too complicated, but admittedly not mainstream outside of Japan (Powell, 2004). "Ideally, I would like watch flowers in spring, and the red leaves in autumn, smelling nature and yet without a wish to make any of these my own, and look upon the dew at dawn and the moon in the evenings sky and from them learn of the impermanence of the world. " There are those that claim that culture or at least all mainstream traditional cultures attempt to hide mortality. No culture could fight wars (and thus win against other cultures) unless it hid mortality from its members (Solomon, Greenberg, Schimel, Arndt, & Pyszczynski, 2004). Be that as it may, there is something about Japanese culture that seems to want to encourage its members to realise their mortality, to look at falling leaves, dew, and cherry blossom, and from them realise the impermanence of existence, including their own. And part of this aesthetic seems to me to include, travelling alone, and realising ones loneliness. A painful, in a sense masochistic but at the same time honest, true, endeavour aimed at going beyond the illusions that culture usually provides us of our immortality. To break the illusion of our immortality we must face up to change and our solitude. So, do you prefer to travel alone or with others? Is there a wabi sabi, honest, enlightenment-orientated beauty to travelling alone, to be lonely, to realise ones isolation. After all we all change, we all die, and we all die alone. Alone is where we are going, so to appreciate its plus side, its beauty, is to overcome fear of the culturally hidden inevitable. Balaz, V., & Mitsutake, M. (1998). Japanese tourists in transition countries of Central Europe: present behaviour and future trends. Tourism Management, 19(5), 433–443. Solomon, S., Greenberg, J., Schimel, J., Arndt, J., & Pyszczynski, T. (2004). Human awareness of mortality and the evolution of culture. In M. Schaller & C. S. Crandall (Eds. ), The Psychological Foundations of Culture (pp. 15–40).